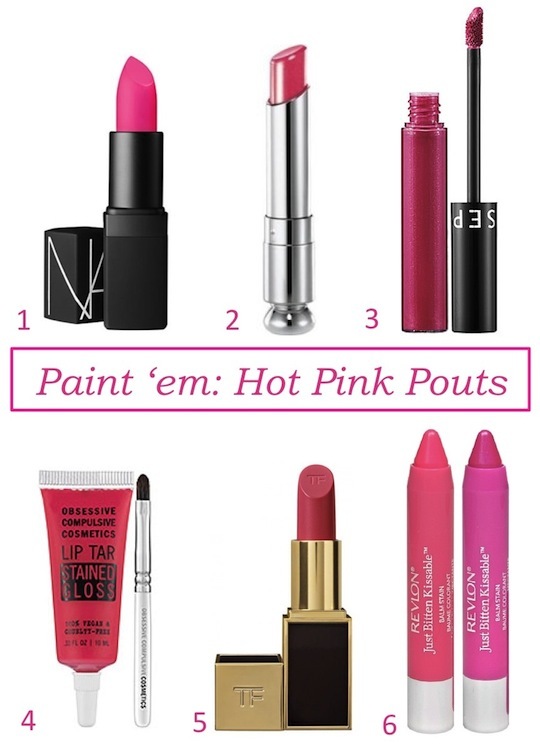 Nothing says summer like a hot pink pout! Shocking, neon pink lipstick, is a fun and easy way to take your fresh face up a notch. It is also a bit more more approachable then traditional power reds. 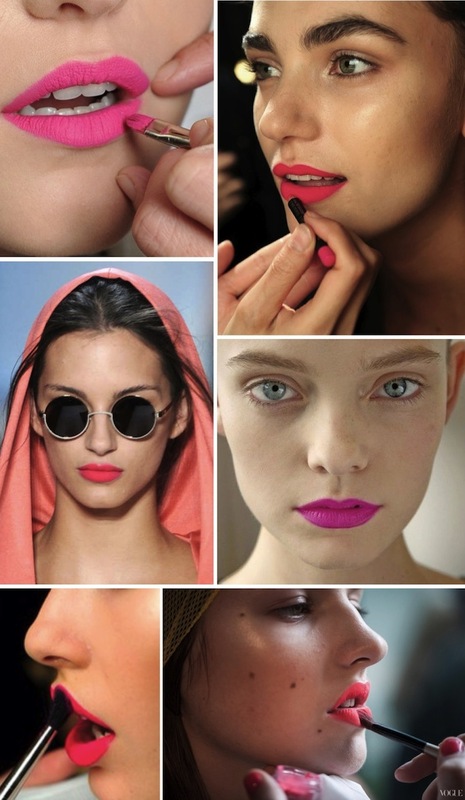 Hot pink lipstick was a fashion show favorite for spring 2013 shows, especially bold matte looks which were seen on runways including Dries Van Noten and Giles. It is also a red carpet favorite for big screen beauties of all skin tones including fair skinned Emma Stone and warmer, exotic toned Jessica Alba. From fuchsia to neon pink to shocking coral to magenta...no matter which shade you chose, bold pink lipstick is a beauty trend of the summer your style can benefit by trying. Now lets get to it - here are some of the best beauty products to achieve a fabulous bright pink pout! 1. Nars Lipstick in Schiap- If you want a runways worthy neon pink pout, Nars lipstick in Schiap gives a shocking dose of color in a fashion forward matte formula. 2. Dior 'Addict' Lipstick in Diorkiss - If you would rather tip toe into the hot pink pond, or you're just looking for a sheer wash of color, Dior Addict Lipstick is your answer. Diorkiss is the fresh pink Kate Moss wears in the ads and is not only shiny, but it has lip plumping properties to bring out the supermodel in you. 3. Sephora Collection Cream Lip Stain - Shown in Electric Fuchsia, this deep pink looks great on olive and darker skin tones and boasts a long lasting yet non drying finish. 4. Obsessive Compulsive Cosmetics Lip Tar Stained Gloss - The 100% vegan and cruelty free neon pink lip product is not only cutely packaged, it has buildable color so you can go from a sheer wash to mega impact in a flash. 5. Tom Ford Lip Color in Flamingo - Known for luxury, at $49 this may be the most expensive lipstick I would ever buy, but I have to say, Flamingo is a bright pink that is as sassy as it is seductive and has just the right amount of coral for my taste. 6. Revlon Just Bitten Kissable Lip Balm - Shown Sweetheart, a vibrant coral pink, and Lovesick, a true fuchsia which I have and love! These jumbo crayons are creamy, don't bleed and true in color. Next on my Revlon list I'm planning on picking up Colorstay Lip Stainstain + Balm which I've heard is fab too. Love that NARS shade, but it's almost always sold out haha! I think only certain women can pull this shade off (I've seen a few fail miserably). However, all the models in your photos can pull it off for sure! NARS Schiap is fabulous! It's one of my favorite shades to wear for summer, but OCC is fantastic too. I love your inspiration pictures! I agree with Alyssa! Nars Schiap is my favorite! I love that gorgeous bright pink lip! Love a pop of bold colors on the lips...thanks for the suggestions! I'm soooo into hot pink lipsticks lately....& currently loving Maybelline's new Vivids line in Shocking Coral & Vivid Rose. But I think I want to try your recom on Revlon's Just Bitten line!!! love the colours an matte lips!! I'm with pp; I love a matte! Currently using Sephora's Cream Lip Stain in Forever Fuchsia but I think I might need to give that Tom Ford lipstick a try. I'm completely obsessed with a pink pout!! I've gotten so many lately, it's kind of sick really. One of my faves surprisingly enough is the cheapest one, the NYX Matte Lipstick in Audrey is a fab pink & has staying power that you would not believe.